Southbridge Brewery – "The excellence of every art must consist in the complete accomplishment of its purpose." Our “108 Year Storm”, our Cub’s victory lager brewed the next day after the Win, is one of the best higher alcohol beers we’ve ever brewed. That’s including our handful of barrel aged experiments, and here’s why. At 8.8%, the beer is incredibly smooth and reminds me of a Grand Cru. That is it’s greatest strength. It’s flavor heavily belies the alcohol warmth of a comparable 8.8% beer, but the warmth is there. It’s grist profile helps since the inclusion of 15% corn helps lighten the whole of the beer while retaining a deep potential for the rest of the experience. We’ve never really elaborated on the journey of creating Chicago Common Brick. It’s had oodles of versions over the last two years and the Brick has become a certain kind of whale. 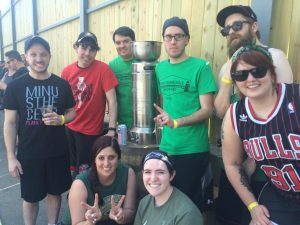 Southbridge Brewery came out to Goose Island’s Sunday Funday event and won the Battle of the Breweries dodgeball tournament. Jon and I are incredibly privileged to represent Southbridge as a part of this event. All proceeds went to Special Olympics, Goose held a fantastic beer festival and I saw nothing but glorious excitement in the crowd. Thank you to everyone for supporting us… here’s a picture of everyone hitting each other. What’s Brewing at Southbridge Brewery? Just a bit of stuff that’s been packaged, in fermentation, in condition, or about to start brewing. Raw Amber, 6.9%, this one is delicious. No Name 57, lagering at ~5.3%, but we nixed the honey in this batch. On October 10 we made the journey down to the land of railroad tracks for a fun little event. We’re real big fans of sessionable and drinkable beers, so this event was a must attend for us. We want to thank Blue Island for having us out for their inaugural Sessh Fest! We had a great time sharing our Southbridge beer with our old fans and happy to make some new fans along the way. Hope you enjoyed the beer, we’re already working on our next festival. This fest will feature beers around and under 4.5%. Jon and I are very excited to be a part of this fest. Travel: Metra! Rock Island Line. Weekend pass for $8 round trip. 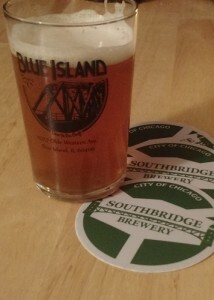 Southside Ale, a Chicagoan ale. Bring Me Home Berry, a blueberry wheat ale. 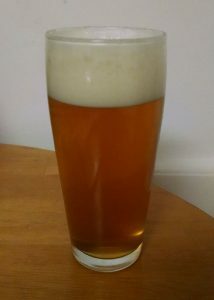 Bunny Prince, a hoppy pale ale. Sweet Midnight Stout, on a nitro pour! Be sure to check in on untappd if you have it. We’ll throw a toast your way. “I worked a service on East 65th street. During my night there I observed a quietly remarkable conversation between the General Manager and the Service Director, both Frenchmen of classical hotel-school training. The issue was a Swiss child of maybe 8 who had fallen asleep under the table, and whose parents refused to wake him up. The Service director was thinking of the other guests: ‘People don’t pay to come (here) and see sleeping children.’ The General Manager was thinking of the parents: ‘People don’t pay to be told where their children can and cannot sleep either.’ At the end of the day, they met in the middle and the child was moved to an empty banquet where he slumbered away for the rest of the 3 hour meal.